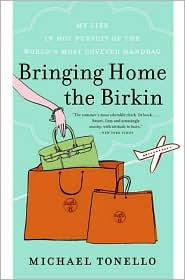 If you are looking for a good read for summer, I highly recommend Michael Tonello’s 2008 Bringing Home the Birkin: My Life in Hot Pursuit of the World’s Most Coveted Handbag. It’s a hilarious account of Tonello’s life once he moved to Spain for a job offer that fell through, started selling high-end merchandise out of his own closet to pay his bills, and once those things ran out, turned to hocking Hermès scarves on eBay. Once he developed a “formula” for obtaining them, he began trading in the ne plus ultra of handbags—the Hermès Birkin. It’s great fun to read how Tonello outsmarts Hermès at their own game of the infamous wait list for Birkins and to follow him as he encounters the various con artists, Hermès addicts and employees during his years as a “Birkin boy.” There are also wonderful descriptions of places around the world his unique job allowed him to visit—my favorite is his chapter on Capri, which he says has the world’s smallest Hermès store—so this book is especially good to read while you’re on a lounge chair, sipping a cool drink. There’s more happening here, however, than just the seemingly insatiable lust for one of the world’s most expensive handbags. There is also Hermès before their goods were available online, an old French company trying to reposition themselves for the 21st century, gaining tighter control over their means of distribution and getting rid of franchises they’d started back when they were unsure of how successful they could be as a global company. I guess we all know how that turned out. Hermès is now so attractive as a luxury juggernaut that it’s easy to understand why Bernard Arnault, chairman of LVMH (Moët Hennessy Louis Vuitton), sneakily found a way to buy a 20.2% stake in the company last year, which Hermès—a family-held enterprise—does not like at all. Arnault also believes in complete control in the marketplace, keeping prices high and promoting the aspirational aspect of luxury items. Wouldn’t he just love to add Hermès to the list of brands LVMH owns. Tonello has included a helpful glossary in the back of his book to teach you the specifics of the Kelly or the Birkin, and between him and the ladies at the Purse Forum, I learned everything I know about both bags. Disgustingly expensive yes, but a Birkin is also one of the most well-designed bags ever made and you may just wish for one yourself after reading Tonello’s entertaining book. I most definitly will search for the book, my dear Jill. This sounds like an interesting book for summer....but I fear it will make me want a Birkin bag! I think I will order this book tonight! Thanks for another great review...I am ready to relax and read after the wedding! Thanks so much for this--I love reading fashion books--fiction or non. I love to read--am in a book club. Read "the world accordingto Garp" this month; remember that? I so, so, SO want to read this! It's crazy that I haven't, especially as I've been wanting to since it came out. With my job working on manuscripts, I rarely read for fun anymore. If I do, it's art history books most of the time. But this sounds so very yummy. I will score a copy soon. Hi Sacramento, you might like this book because of Mr. Tonello's deep affection for Spain. Between meeting you and reading what Mr. Tonello loves about Spanish people, culture, food and wine, Spain is at the top of my list of places to visit! Hi Adrienne, oh yes, you will want one after reading this book. I forgot to mention there are color pictures of some of the Birkins and Kellys Tonello bought and sold during his time as an Hermes reseller. If I ever realize my Birkin dreams, it will be vintage for sure. My dream would be a Birkin 30 in Blue Jean Togo with palladium hardware! Hi Pam, I think this would be a great post-wedding book for you to read. I am loving the pictures you've posted so far and I'm going back to your blog hoping for more! Hi Paula, I love fashion books too. I've really been bitten by the bug in the last 5 years. They now trump fiction on my nightstand. You know, I never have read any Irving. I was a bookseller for 5 years and plenty of customers and fellow booksellers loved him. I was so excited for him when he won an Oscar for 'The Cider House Rules.' He may be the only writer in Oscar history to adapt his own novel for the screen and then win an Oscar for the screenplay adaptation! Hi Catherine, I think you'd like this book, it's such a fun read and you really get to know how Hermes works as a company. I need to keep this in mind when I'm there, although Linda at the Wall Street is so wonderful, there's none of the snootiness Tonello comes up against in the French and Italian Hermes stores. If I had to deal with that, I think I'd just walk out. I read this book a few years ago and loved it! It was fascinating to me. Cause I am so obsessed with Birkins. I can spot a Birkin or a Kelly a mile away. I really love your posts! You indulge your readers on so many levels. I'm going to visit more often. Promise. It the purse just weren't so heavy! I learned to favour canvas over leather, because of the lightness of coated textile. Hi Paula, thanks for stopping by! You know, I've never handled a Birkin but when I see pictures of the 40 I always think the same thing, it looks like it weighs a ton. If I ever do get one, it will be vintage and I don't think I could go higher than a 30cm. Didn't Jane Birkin say hers gave her carpal tunnel syndrome?